In stock -This product will ship today if ordered within the next 8 hours and 57 minutes. 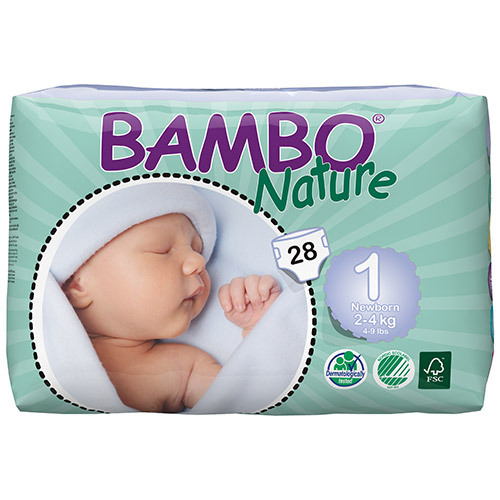 Bambo Nature Newborn (Size 1) Nappies are a premium nappy for newborn babies weighing 2-4kg (4-9lbs). Bambo Nature nappies are premium, eco-friendly and dermatologically tested. They feature a breathable textile-like backsheet, flexible side panels and a super absorbent core to provide the perfect fit and comfort to your baby. The backing sheet is breathable, yet waterproof, allowing your babies skin to breathe and most importantly, stay dry. There is a re-adjustable hook and loop fastener that can be opened and closed as often as you like, and with no elastic in the waist band to ensure no irritation to your baby`s delicate skin. Bambo Nature nappies have been shaped to fit your baby’s body perfectly, and are less bulky, to give your baby freedom of movement. The Bambo Nature range is designed and manufactured in Scandinavia by the Abena Group, a large international health care wholesaler and one of the first manufacturers of baby nappies in the world that continue to lead the way with product innovation and effective manufacturing today! Materials: Textile back sheet (outer side) of polypropylene (PP) and polyethylene (PE). Absorbent of polyacrylate (SAP) and cellulose (ECF fluff). Inner side of non-woven (PP). Acquisition layer of non-woven (PET/Co-PET). Hook-and-loop fastening of non-woven (PP/PE). Glue made of synthetic rubber - no optical brightener added. Elastication made from elastane. No perfumes or moisturising lotions have been used in the product. Do not flush the baby nappy in the toilet. To avoid suffocation keep plastic bags away from babies and children. Below are reviews of Bambo Nature Newborn (Size 1) - 28 Nappies by bodykind customers. If you have tried this product we'd love to hear what you think so please leave a review.